The goal of the Copenhagen Accord – to limit temperature increase to 2°C is still in reach – but the actions to get there are far beyond what we see being implemented around us today. A thought experiment with our En-ROADS global energy model makes this clear. 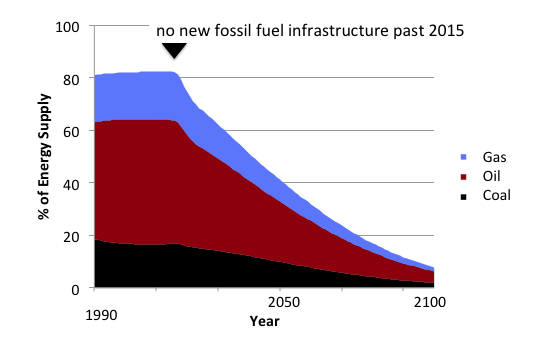 What if, in 2015, we eliminated any new investment in fossil-fuel-using infrastructure, anywhere in the world? En-ROADS shows a surge in creation of new low-carbon energy sources, and an improvement in the global temperature by 2100 compared to ‘business as usual’. Rather than the 4.5°C of temperature increase under ‘business as usual’, the scenario results instead in 3.2°C of warming. Eliminating new fossil-fuel-using power plants, automobiles, and factories just a few years from now sounds very drastic, of course, so why don’t we see more impact on the global temperature? The figure to the left helps explain why: even though no new infrastructure is built after 2015, the existing infrastructure lives on (and continues to produce CO2 emissions throughout its lifetime), only fading away in the second half of the century. (See the black wedge of energy from coal and the red wedge from oil in the figure). To meet the 2°C goal the world would need to go further than just eliminating new fossil fuel using infrastructure. In addition to ending new investment in fossil fuel, what if we also had sustained global progress ending deforestation and eliminating other greenhouse gases, and we tripled the baseline rate of improvement energy efficiency? In that scenario, the global temperature increase by the end of the century comes very close to the goal laid out in Copenhagen: 2.1°C over pre-industrial temperatures by 2100. One more modification to the scenario, slowing the growth of the global economy from 3.5% per year to 3.0% per year brings us to a mean global temperature increase of 2.0°C. Of course given uncertainties about the climate system, that’s just a middle estimate, which assumes a climate sensitivity of 3°C per doubling of CO2 in the atmosphere. The same scenario could give a global temperature increase at the end of the century as low as 1.5°C or as high as 2.8°C using a range of climate sensitivities ranging from 2.0 to 4.5°C per doubling of CO2, the most likely range suggested by the IPCC. If the world wanted more certainty about meeting the 2°C goal, that would require additional measures such as shutting down already-constructed fossil-fuel-using infrastructure before the end of its useful lifetime, further reducing energy demand, or achieving so called negative emissions, where CO2 is removed from the atmosphere through sequestration. One thing this thought experiment makes clear: the longer we wait to end investment in in new fossil-fuel-dependent infrastructure, the more we commit future generations to higher levels of warming, to costly decisions turn off that infrastructure before it wears out, or to yet to be proven technologies, like negative emissions. Proposals based on stopping and slowing are the reason why politicians find it so easy to obstruct climate progress. “Ambition” in climate policy should create space for radical rethinking that reframes proposals so they can actually happen. For example I’s suggest fixing market prices to prevent externalities so that both economic growth and climate action take off. Forget the traditional go-slow eco-dogma. I agree. The ‘stop new fossil fuel investment’ wasn’t meant as a real world policy proposal – but as a ‘thought experiment that we hope helps capture the momentum represented by existing long-lived fossil-fuel using capital. Yes, real world policy should align economic growth and climate action – with the end of fossil fuel investment as a symptom not a driver. This should (must) be achievable. Slightly more challenging, but also necessary, is to sap the momentum of fossil fuel capital investment by finding funds to pay it off. And to run carbon-negative energy sources such as sustainable biochar.